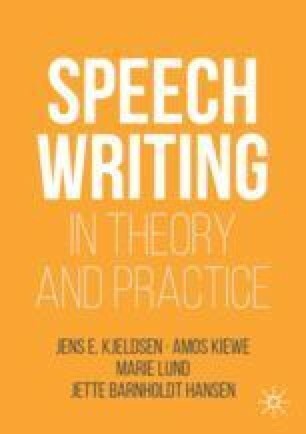 This chapter explains the importance of visual rhetoric in speechwriting and discusses the power of the visual. Time and again, the ancient rhetoricians encourage us to put events vividly in front of the audience so that they experience them as if they see them with their own eyes. The advice is equally valid today. We show how good speechwriters draw pictures with words, and how speakers may use places and props rhetorically. We discuss the use of visual aids such as PowerPoint. Often speeches using slides end up making the speaker reiterate facts instead of communicating vividly, telling stories, and presenting arguments. Used properly, though, slides may be efficient in presenting a case. We explain how slides can benefit, rather than harm the speech.